As we chugged past Piscacucho, conventionally known as Kilómetro 82, we spotted the colorful fauna endemic to the Andes near Cuzco: hikers and their porters, carrying tents, sleeping bags, stoves, long johns, food, water and everything else required in a four-day trek along the Inca Trail to Machu Picchu. I turned back to my table and dug into a tasty hunk of alpaca tenderloin. Grilled to perfection, it was drizzled with pink pepper sauce and flanked by crisp baby carrots, turnips and string beans. The railroad car rattled a bit as a waiter offered to refresh my glass of Tacama Blanco de Blancos, an excellent Peruvian Sauvignon. Why not? It was only 11:30 a.m. I didn't expect to be at Machu Picchu until early afternoon. Not the usual way to carbo-load before climbing to a ruin in the cloud forest at 8,000 feet. It was the Hiram Bingham way. Hardly, of course, the way Bingham, the Yale professor of Latin American history, arrived on July 24, 1911, thinking, wrongly, that the jungle-covered compound was the last stronghold of the Incas. Though Bingham wasn't the first to see Machu Picchu since it was mysteriously abandoned in the 16th century, he brought it to the world's attention. Which is why PeruRail gave his name to its new, opulent train that runs between Cuzco and Aguas Calientes, the town from which buses ascend a zigzag nine-mile road to the ruins. While dress on the Hiram Bingham, which started service in October 2003, tends to khaki, the décor calls out for black tie — Deco interiors, single red roses in white bud vases, bottles of chilled champagne perched on the long, wood bar. And so does the price — a whopping $416.50 per person, round trip. The next-most expensive train on the route, the Vistadome, costs $89.25, and the aptly named Backpacker is just $59.50. True, the Hiram Bingham offers brunch, a tour and a four-course dinner on the return, among other amenities. But one of the sweetest, surely, is avoiding the too-early wake-up call for the Vistadome, which leaves at 6 a.m., or the Backpacker, at 6:15. The Hiram Bingham departs from Poroy, a station 20 minutes from central Cuzco, at the civil hour of 9 a.m. And while it pulls into Aguas Calientes at 12:30 p.m., more than 2 hours after its plebian counterparts, it starts back at 6:30 p.m., while the Vistadome leaves at 3:30 and the Backpacker at 3:55. Which means you can see the sun set over the ruins without the crowds. In Cuzco, we considered the elegant Hotel Monasterio, an affiliate of the Sanctuary Lodge, but chose the Picoaga, a pleasant four-star hotel in a renovated colonial mansion, for less than half the price. Arriving in the afternoon, we relaxed, adjusting to the air at 11,000 feet and ambling two blocks to the main square, the Plaza de Armas, where I quickly spent the money we'd saved on the hotel on baby alpaca knitwear. At 8:30 the next morning, the party at Poroy Station was already under way. 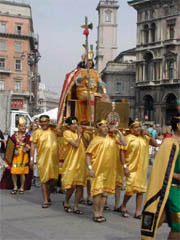 Musicians in spangled capes played folkloric music. The crew proffered glasses of Bucks Fizz, a sparkling wine with fresh orange juice. It seemed rude to decline. There were three blue railroad cars — imported, we learned from Singapore — a kitchen car, a bar car and a dining car, which seats 42. Depending on demand, PeruRail can add another dining car. But that wasn't the case on our journey, which we shared with four other travelers — a Brazilian woman and her aunt, and two young Peruvian honeymooners . Each group took a table in the wood-paneled, brass-accented dining car. Newly built, it had an updated 1920's look, with tasteful gray, yellow and green upholstery and floral wall lamps. Rattling past potato fields, we moved to the bar car, where we ate chocolate-filled croissants. Our effervescent, English-speaking guide, Alejandra Cuba, pointed out landmarks including Verónica and Salcantay, snow-capped peaks venerated by the Incas. Then it was time for brunch. By the time we'd devoured our mango mousse, the flowering cactus brushing the window had given way to bromeliads and tiny red orchids. We were descending into the beautifully named ceja de selva, or eyebrow of the jungle. We arrived in Aguas Calientes at 12:30. A half hour later, the special bus for Hiram Bingham passengers deposited us at the hotel, an unassuming lodge nestled, on a rare spot of flat earth, against a densely vegetated slope. Winding, well-paved Inca trails beckoned above. Our second-floor room was appealing: rustic in a kind of elegant way, international in style with just a touch of Andean influence woven into the wall prints and furnishings. Though the space was a tad small for a king-sized bed, the tiled shower was huge and the pressure surprisingly good. The view, as promised, was stunning — rippled mountain peaks, clouds drifting by. But to our horror, ugly sounds and nasty fumes drifted in! Our $626 sanctuary was situated directly over the bus stop. Because it was just one night, we decided not to complain, although we would have if we had known that there were five doubles overlooking a charming grass terrace. At 2 p.m. we met Alejandra for our tour, which is included in the package and must be taken on the day of arrival. She led us, along with the Brazilians (the honeymooners got their own guide) past the masses of day-trippers lunching at the hotel's buffet. Two minutes later, we were in! The Incas had aesthetic and spiritual reasons for situating Machu Picchu just so on that particular ridge, oriented for maximum impact from the sacred peaks around it and for spectacular views of the valleys below. Scholars now believe that Pachacuti, the Inca emperor, built the compound in the mid-15th century as a royal retreat with a strong emphasis on ceremonial and ritual activities. I tried to imagine the cascading agricultural terraces decked with brilliant flowers, fountains flowing between the polished granite buildings with neatly thatched roofs, the inhabitants (not to mention the llamas) adorned in fabulous, elaborate textiles. Though my mental adventure was interrupted by tour groups and clusters of high-school kids, the site wasn't nearly as crowded as I'd feared. July and August are the busiest months, Alejandra said. As we traversed what's known as the urban sector, where about 200 houses and temples occupy a narrow ridge, Alejandra discoursed on Inca customs, cosmology and engineering. While parts of her talk were directed at a different audience — she produced a photo of Bingham and insisted he resembled Indiana Jones — even Moico says he learned things about Inca artistry. Our guide emphasized the way Inca craftsmen carved and sculptured natural rock formations, building structures in and around them. One of our favorite spots was the cave beneath the Temple of the Sun, where nimble-handed masons had filled the irregular space between two large rocks with hourglass-shaped stonework. And on the climb up the Intiwatana Pyramid, we admired an "image rock," a natural outcropping transformed with judicious tweaks into a representational sculpture of the peaks in the distance. A 3:30 tea was optional on the program, but we were hungry again, and besides, the ruins have no bathrooms. So we headed to the hotel for tasty sandwiches and pastries. After thanking Alejandra for a lovely day, we reported for our massages, which we'd booked earlier. 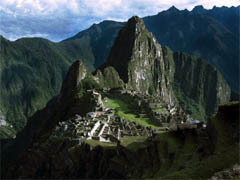 I pondered the offerings: Inca Massage, Altitude Problems, Energizing Massage. The masseuse suggested a mixture, which turned out to be a gentle, integral massage. I zoned out, visions of the mountain peaks dancing in my head, awakening as condor feathers, a curative in Inca lore, were waved over me. Only hotel guests can experience the 6 a.m. sunrise, since the first buses arrive at 7. So over a dinner of sea bass and salad and Peruvian white wine, we tackled another burning question: wake-up call? Opting out of the sunrise, we slept in. After breakfasting on papaya juice, trout, white cheese and scrambled eggs, we headed for the trails we'd spotted above the hotel the day before. Two hours later we were at the Gate of the Sun, from which travelers on the Inca trail get their first dramatic view of the compound. Moico, as usual, hunted for orchids, delighted with the profusion. I, as usual, brandished binoculars, finally spotting an ocher bird with a black-and-white speckled neck and black-tipped wings. Moico whipped out "Birds of Machu Picchu," and there it was: Streak-throated Bush-Tyrant, or Myiotheretes striaticollis. After a delicious lunch at the hotel we collapsed in the soft grass in a plaza in the urban sector and watched the ruins empty out. On the return trip, the bar car was positively boisterous: there were 19 passengers, mostly day-trippers, including New Yorkers, San Franciscans, Mexicans and a Czech. The Tacama Brut, a local vintage, was on the house. We drank and mingled, then headed to dinner: Cusqueñan vegetable terrine, cream of pumpkin, sea bass, peach cobbler, all excellent. More than an hour remained. We were full, tipsy and tired. Time to lean back and doze off, but where? The banquettes were making us cranky. For those business-class prices, we thought, there should be business-class seats. Finally, shortly after 10, we stumbled into the chilly Cuzco night and headed back to our quiet hotel room. Some guidebooks insist the Inca Trail is the only way to properly experience the journey to Machu Picchu. But I honestly didn't have the time or the inclination to camp with dozens of strangers. And after all, as Hugh Thompson recounts in his entertaining Andean travelogue, "The White Rock," Hiram Bingham himself insisted that goodies like strawberry jam, sweet chocolate, bacon, sausage and kippers be served on his expeditions. If he didn't believe in roughing it, why should I? 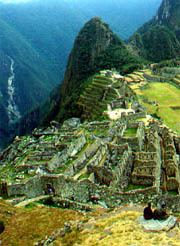 LanPeru (866) 435-9526, www.lan.com, has direct flights to Lima from Kennedy Airport nightly, as do several other airlines. Round-trip fares range from around $590 to over $1,000 in summer and for major holidays. 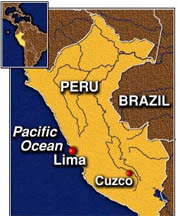 Many local airlines fly to Cuzco from Lima. 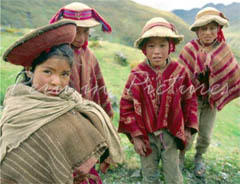 We paid about $191 each, round-trip on LanPeru. 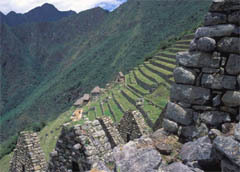 The Hiram Bingham runs daily except Sunday between the Poroy Station in Cuzco and Aguas Calientes; $416.50 per person. Reserve on line at www.perurail.com, or via fax (51-84) 22 2114. PeruRail recommends payment via bank transfer before arrival. Tickets can also be picked up at Wanchaq station, Avenida Pachacutec s/n, Cuzco (51-84) 23 8722, fax (51-84) 22 1114. Only cash is accepted; there is an ATM at the station. 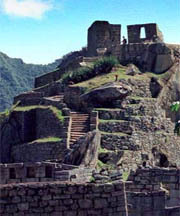 The fare includes brunch, bus service to and from the ruins, admission, usually $20, to Machu Picchu, a guided tour, afternoon tea at the Sanctuary Lodge, and cocktails and a four-course dinner on the way home. It's advisable to have your hotel arrange for a taxi to pick you up at Poroy Station, because there is no taxi stand there. 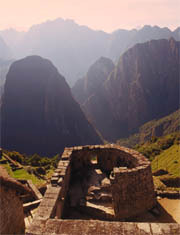 Schedules for all trains to Machu Picchu (including the Vistadome and the Backpacker) are at www.perurail.com. Buses run from Aguas Calientes to the ruins ($9) from 6 a.m. to 1:30 p.m. Machu Picchu is open from 6 a.m. to 6 p.m.; admission is $20. Hotel Monasterio, one of Cuzco's most lavish, is housed in a converted seminary, Calle Palacios 136, Plazoleta Nazarenas, (51-84) 24 1777, fax (51-84) 24 6983. Prices for the 126 rooms range from $292 for a single to $897 for the royal suite. The Monasterio is affiliated with the Machu Picchu Sanctuary Lodge, Calle Ruinas Machupicchu S/N, Machu Picchu, (51-84) 21 1039/38, fax (51-84) 21 1053. The hotel has two suites with terrace and view ($711 per night) and 29 guest rooms, $626 for those with view; $547 for those without. Three meals are included; wine, bottled water and tea are extra. Reservations for Monasterio and Sanctuary Lodge can be made by calling (800) 237-1236. Picoaga Hotel in Cuzco, Santa Teresa 234, (51-84) 22 7691; fax (51-84) 22 1246, on the Web at www.picoagahotel.com, is a comfortable converted colonial mansion with 72 rooms that range from $120 for single to $170 for a suite. Breakfast is included.